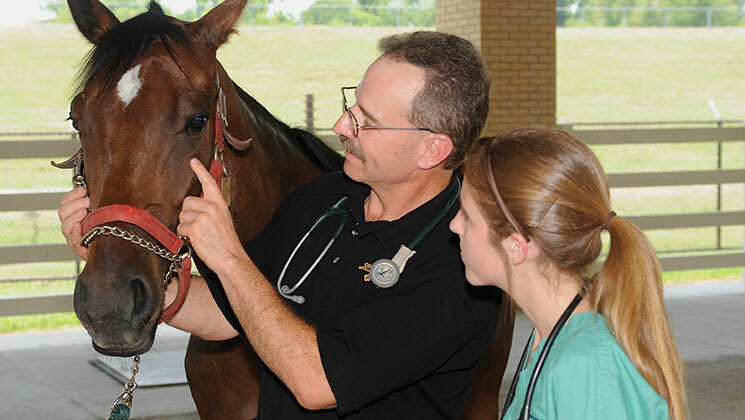 Dr. Daniel Burba, professor of veterinary surgery, works with a student in the Equine Health Studies Program. Since its dedication in 2011, The Charles V. Cusimano Equine Physiology and Pharmacology Laboratory has been home to summer scholars’ and graduate students’ projects. The lab is named for Charles Cusimano of New Orleans, a friend of the LSU School of Veterinary Medicine who is a horse owner and equine enthusiast. The laboratory is central to the LSU School of Veterinary Medicine Equine Health Studies Program’s core research efforts. There, collaborative studies are conducted in the areas of vascular and nonvascular physiology and pharmacology as they relate to laminitis and airway diseases, pain management, gastrointestinal diseases, and reproduction. Recently, Cusimano was honored through the new Cusimano Laboratory Research Support Fund, established with a $25,000 gift made by another friend of the school. The gift will fund equine studies, including graduate students’ research in the lab named for Cusimano, as part of the Equine Health Studies Program. The EHSP is the premier equine biomedical center in Louisiana and the South. The program, together with the equine clinic at the LSU Veterinary Teaching Hospital, provides state-of-the-art diagnostic and therapeutic solutions for critically ill and injured horses in Louisiana and the surrounding area. Cusimano’s commitment to the university stems from connections to LSU that are nearly 70 years deep. He attended LSU on a football scholarship, lettering for four years and playing in the Cotton Bowl in 1946 and the Sugar Bowl in 1950 before graduating with a BS in petroleum engineering in 1951. Cusimano is a former member of the LSU Board of Supervisors who began his service in 1974 and served as chairman in 1995-96. He was admitted to the LSU Law Hall of Fame in 1987 and the LSU Engineering Hall of Distinction in 1999. In addition, he helped establish religious centers on each of LSU’s campuses.